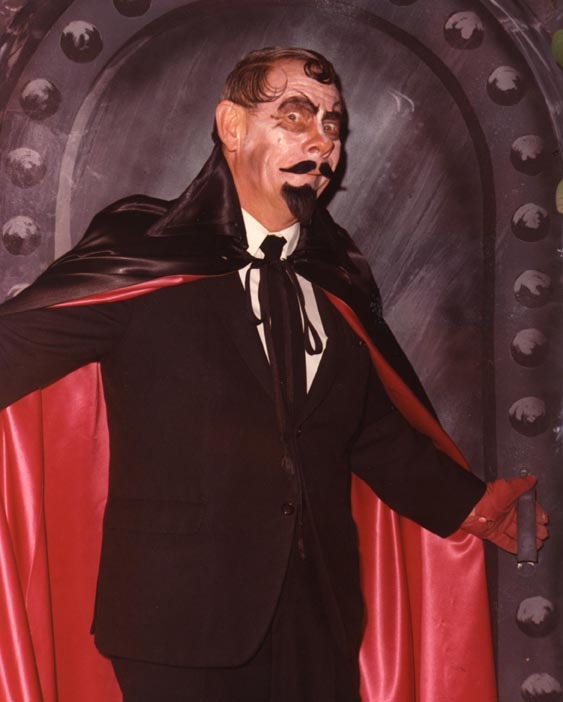 Jim Clatterbaugh, Editor/Publisher of Monsters from the Vault, here: I'm a "Monster Kid" who grew up in the 1960s loving horror and sci-fi films and the monsters that starred in them. Whether I was huddled in front of the TV watching Universal classics on Sir Graves Ghastly Presents or Shock Theater, or catching the latest Hammer offering at a Saturday matinee, or picking up the new issue of Famous Monsters of Filmland or Castle of Frankenstein, or hitting the local Woolworth's or hobby store for the latest monster toy or Aurora model?I couldn't get enough of monsters! After graduating high school I joined the Air Force, and for the next 7 or 8 years I left the monster world behind. But around 1985, I discovered my local PBS station was showing the classics (with a host), and I fell in love all over again. I began my quest of obtaining all monster-related items from my childhood (a lot harder than it is now, thanks to eBay) and began attending horror-related conventions throughout the United States. I also had the good fortune of visiting Forrest J Ackerman's (Editor of Famous Monsters of Filmland during its more than 25-year run) house (dubbed the Ackermansion) three times during that period. Then, in 1992 when I was stationed at Andrews AFB, MD, I met Gary Svehla, Editor/Publisher of Gore Creatures/Midnight Marquee (one of the many genre-related fanzine/magazines I was reading), and attended the FANEX convention he sponsored, along with his wife, in Baltimore. Over the next couple of years, I met many of the stars and filmmakers of some of my favorite films at FANEX (as well as at Chiller Theatre and Monster Bash). I also had the good fortune to meet and become friends with some of the best genre writers out there (who were regular contributors to the magazines I was reading). In addition, I met Michael Kronenberg, Art Director for an Alexandria, VA-based trade magazine. I told Mike that I'd always wanted to publish a fanzine/magazine on classic horror/sci-fi films; he said if I ever wanted to make my dream a reality he'd be happy to design it and do the layout. I approached some of the writers I'd met; once they agreed to contribute we kicked around a couple of names, and Monsters from the Vault was born. The first issue (only 500 copies were produced) premiered at the FANEX convention held in summer 1995 and was originally intended to be a one-shot, but it was so well received we decided to publish a second issue in early 1996. Then, with issue #3 Michael's brother, Steve Kronenberg, came onboard as a regular contributor and Co-Publisher. It was also around the time of the first issue that I met my future wife (an editor by profession) at a meeting for the group (The Horror and Fantasy Film Society of Baltimore) that supported the FANEX convention. Marian (a horror-and-all-things-Halloween-related fan) and I were married in 1997, and by marriage she became the Copy Editor of Monsters from the Vault. We continued to press on, and in 1998 I retired from the Air Force after 20 years and remained in the Baltimore area. 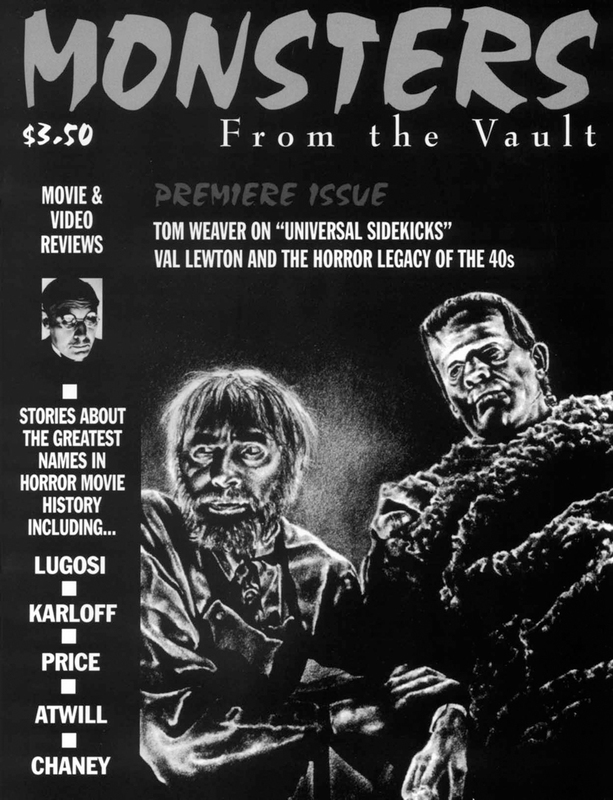 While Michael had to drop out as MFTV Art Director in 2002 because of the demands of his real job, and Steve also had to cut back on his contributions, Monsters from the Vault will soon be entering its 14th year of publication, and issue #25 will be published in June 2008. In addition to my real job as a contractor Test Director working for the U.S. Army, I assumed the art director duties when Michael left, and Joe "Sorko" Schovitz has provided the cover designs since 2003. Recently artist Daniel Horne came onboard as the new cover artist for Monsters from the Vault, and his beautiful Werewolf of London painting scheduled to appear on issue #25 will be the first painting to appear on our cover. Monsters from the Vault's sole purpose is to keep the memories of the monsters of my (and our contributors' and readers') childhood alive and well. The magazine is currently published twice a year. The magazine features in-depth articles by, in my opinion, the best writers in the business (Bob Burns, Mark Clark, Greg Mank, Michael Price, Gary Rhodes, Bryan Senn, Tom Weaver, and many, many more); tons of beautifully reproduced photos (many of them rare); and DVD, book, and CD reviews in each and every issue. I'm extremely proud of what we've accomplished over the past 13 years and hope to continue to provide "The Best in Classic Horror" for many years to come. I'm also happy to say Monsters from the Vault is all classic?all the time! So, if you love classic horror/sci-fi films and the monsters they feature as much as I do, welcome to our Web site?if it?s not your thing, thanks for stopping by!